"This report demonstrates that Fatah's Facebook page is repeatedly in violation of Facebook standards and that there can be no justification for Facebook to allow its continued operation." The social media giant Facebook with its broad reach and instant messaging has great potential to disseminate good values, but also bad ones. With Israel still suffering from Palestinian terror, Palestinian Media Watch has examined the attitude of Mahmoud Abbas' ruling Fatah Movement towards Palestinian terror as expressed in its posts on its official Facebook page in 2018. The Facebook page examined is the official page of the Fatah Movement. (Palestinian National Liberation Movement "Fatah"/The Official Page, https://www.facebook.com/officialfateh1965/). PMW's fundamental finding is that Fatah actively uses Facebook to glorify murderers, both past and contemporary, and to encourage violence. Fatah is in clear violation of Facebook's Community Standards, which prohibit use of its platform by those involved in "terrorist activity" or for "praise for individuals involved in these activities." Palestinian terror can be divided into three categories by periods: Pre-Oslo Terror, Post-Oslo Terror, and Contemporary Terror. Fatah uses Facebook to glorify terrorists and attacks from all of these periods. Pre-Oslo Terror includes the Munich Olympics massacre of 11 Israeli athletes in 1972 and the Coastal Road massacre of 12 Israeli children and 25 adults in 1978. Both of these attacks as well as other murderous attacks and terrorists from this period were glorified by Fatah on Facebook in 2018. Post-Oslo Terror includes the hundreds of suicide bombings, shootings, and stabbings which have murdered more than 1,600 Israelis [mfa.gov.il] since the Oslo peace accords were signed between Israel and the PLO in 1993. Terrorists such as Ahmed Yassin, founder of Hamas; Nasser Awais, one of the founders of Fatah's terror wing the Al-Aqsa Martyrs' Brigades, were responsible for hundreds of murders in the post-Oslo period, especially during the PA's terror campaign, the second intifada (2000-2005). Both these terror leaders and many other terrorists from that period were glorified by Fatah on Facebook in 2018. Contemporary Terror includes attacks by Palestinian terrorists that continue today. For example the murder of two young Israelis, Kim Levengrond-Yehezkel, 29, mother of a 15-month-old, and Ziv Hajbi, 35, father of three, who were shot and killed by their Palestinian co-worker. They were murdered in 2018 and their murderer, along with others who killed Israelis that year, were glorified by Fatah on Facebook in 2018. He will not abandon you or harm you"
"Eternity and praise to our righteous Martyrs, may Allah have mercy on you and let you dwell in the open spaces of Paradise." "The heroic Martyrs of the homeland are sketching the map of the homeland with their pure blood, so that Palestine will be free and Arab. Eternity and glory to you." "[The winds] spread a scent at the place, which they say is similar to the scent of musk - and it is not surprising, for on that ground is a Martyr who was killed for his Lord and his land. His pure soul went out to the Lord of Heaven and earth in order to enjoy the pleasures of the world to come." "These are the Martyrs of Palestine. They live today with their Lord." "Fatah prays for the souls of Martyrs [Ashraf] Na'alwa and [Saleh] Barghouti." "Three moons are being hosted by Allah this morning. To the Gardens of Eternity (i.e., Paradise)"
"The Palestinian West Bank branches of the Fatah Movement accompany to the weddings (i.e., a Martyr's funeral is considered his wedding to the 72 Virgins in Paradise in Islam) our heroic Martyrs [Saleh Barghouti and Ashraf Na'alwa]"
If you kill an Israeli, you can be our next hero, just like Ashraf Na'alwa. Fatah's 150,000 Facebook followers are given the unequivocal message that murdering Israelis is not only desirable, but is also the fastest path to honor and fame for the terrorist and his/her entire family. Fatah uses its Facebook page to encourage violence and terror in other ways as well, for example by posting images of rifles and masked men carrying weapons. Through Facebook, Fatah glorifies not only the murderers of Israelis but also of foreign nationals. In 2018, it honored Japanese Red Army terrorist Kozo Okamoto who murdered 24 people, mostly Christian pilgrims from Puerto Rico, in the Lod (Israel) Airport massacre in 1972. Fatah also honored terrorists who attacked Israelis abroad, including the terrorists who murdered the 11 Israeli athletes at the Olympics in Munich, Germany. Fatah used Facebook not only to honor terrorists from its own terror branches, Black September and The Al-Aqsa Martyrs' Brigades, but also terrorists belonging to Hamas, Islamic Jihad, PLO, and the PFLP - all internationally designated terror organizations. While this report covers 2018, Fatah's terror promotion is not new. Palestinian Media Watch has documented that Fatah has used its official Facebook pages to promote violence and glorify terrorists for many years and continues to do so in 2019. The many examples of glorification of terrorists and terror promotion from all periods cited in this 2018 overview report, demonstrate that Fatah continues to be an active terror-promoting organization and that Facebook allows itself to be a part of that terror promotion. We also remove content that expresses support or praise for groups, leaders, or individuals involved in these activities." This report demonstrates that Fatah's Facebook page is repeatedly in violation of Facebook standards and that there can be no justification for Facebook to allow its continued operation. This Palestinian Media Watch report demonstrates that the Fatah Movement used its official Facebook page throughout 2018 to glorify terror and terrorists, and to support continued Palestinian terror against Israelis. As its fundamental policy, Fatah glorified terrorists from all periods of its history including mass murderers and suicide bombers. 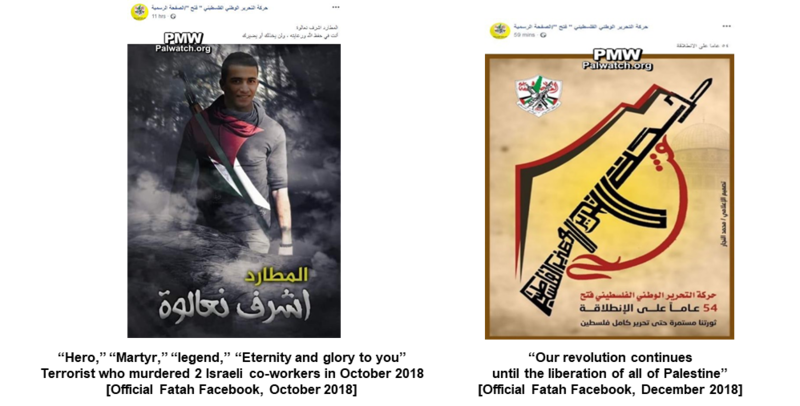 Significantly, immediately following terror attacks, Fatah used Facebook to praise the contemporary terror and glorify new terrorists throughout the year. Although Fatah's use of Facebook for these purposes is in direct violation of Facebook's guidelines set out in its Community Standards, Facebook has not deleted these terror glorifying and terror promoting posts, and has not closed down Fatah's Facebook account. The terror glorification and promotion of violence by Fatah together with Facebook's willingness to be a platform for the dissemination of these messages is a lethal combination. As Palestinians see their colleagues, friends, and neighbors being honored as heroes just days after they have killed Israelis, and as they read that Fatah pledges it will use "all means" including the rifle against Israel, the seeds for future terrorists have been planted.